The sun's barely set on summer and we're already being forced to think about Christmas because social media. There's just 111 days until Santa dumps his sack under your tree so it's time you started making a list, checking it twice etc. etc. With just 15 Mondays until Christmas Day, we're already getting excited about the festive fun that awaits us but mostly just the prospect of getting festively plump and jolly all in the name of baby Jesus. The holiday season isn't without its problems though - drunk relatives and family dramas are all part of the package - but we've found the Christmas jumper that'll help you sail through these testing times in a jolly haze. Allow me to introduce you to Tipsy Elves - the people you have to thank for single-handedly saving you from many champagne-fuelled family disagreements come December 25th - and the single best invention of 2017. Enter: the wine-bottle-holding Christmas jumper, not its real name. 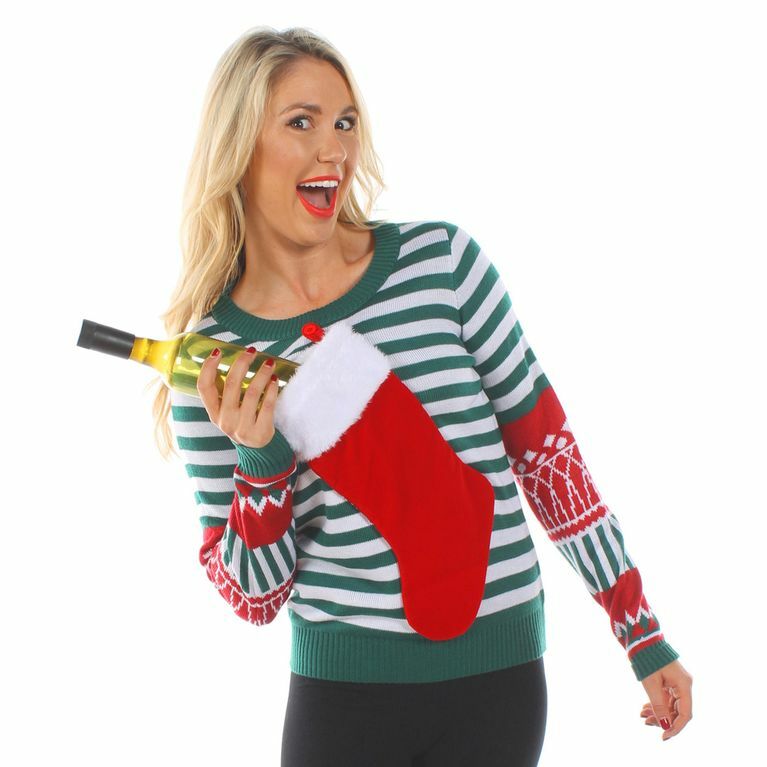 The clothing in question is emblazoned with an appropriately festive pattern but the stand-out feature is the pocket stocking that's big enough to store a full bottle of wine. Do you know what that means? No longer do you have to pain yourself to move from couch to coffee table to pour yourself another (definitely necessary) glass of wine (or any tipple of your choice tbh) as you can simply reach into your pocket, grab the bottle and pour away. Now if that's not living, I don't what is tbqh. However, such a privilege comes at a price with a jumper setting you back $69 (around £53), plus shipping. But can you really put a price on such convenience? No and for that reason, I've already ordered one.